Some time ago, I wrote about my cunning plan to build the lightest, cheapest possible observatory: Plant a pier in my back yard, attach a telescope to it and use that as the base of my observations and photography. At that stage, I was about half-way excavating a hole for the pier, and had run into difficulty with a large rock placed exactly where I didn’t need it. Read on to see how I dealt with that problem, and how the finished product has worked out! To recap, the hole was at about half the depth I wanted, and was dominated by an enormous hunk of quartzite that I couldn’t move and which was too strong to break with the tools I had handy. After much wringing of hands and asking advice on my Google Plus page, I decided to just shift up the hole a bit. It didn’t take long to dig away the north face of the hole by about twenty centimetres, enough to clear space for the pole, but not enough to keep the rock from encroaching on the rest of the hole. It only took a few more hours work to dig the hole down to the depth I wanted, and prop the pole up in place with some bits of scrap lumber. In preparation, I’d already bought a bag of concrete mix and had a large board handy to use as a mixing surface. Let me state right up front that mixing concrete by hand is hard work. It was harder than digging the hole, and strained my back more than carrying the bags from the car to the back yard (I do not own a wheelbarrow). The process is simple enough: Cut open the bag, and pour out the aggregate (a mix of river sand and gravel) onto a flat surface. With a spade, carve a cater in the middle of the heap. Open the sealed bag of cement that was packed in with the aggregate, and pour it out into the crater. Carefully mix this lot together with the spade. Once the cement is nicely distributed through the aggregate, dig out that hollow again and pour in a few litres of water. Start mixing this lot up again, this time being careful to catch the inevitable little rivers of water that will try to spill out before it’s all been absorbed. Keep mixing till everything is even. If necessary, add more water, and repeat this whole process till your concrete is at the desired consistency – it should be wet, but not sloppy. It should look like wet sand, not mud, and it should hold any shape you can mould in with the space. Drop the spade to the ground, click your back, groan heavily, massage your sore muscles, and then mix some more. So once this was done, I took the hose and gave the hole a light spraying, to wet the soil and the pole. Then I shovelled all that concrete in. It was a bit discouraging to see how much hole remained after so much hard work, but no matter. Covered the hole with a board, gave the wet concrete a light sprinkling of water, and went inside for a hot steaming bath. The concrete set overnight till it was hard enough to hold the pole unsupported. Ideally, one should keep the concrete wet till it has fully cured, to get maximum hardness, but I didn’t particularly care about that. This concrete base’s job is to be an enormous mass at the base of the pole, to give it stability. It does not carry a structural load. The following weekend, I headed out to the hardware store and bought another four bags of concrete mix. It almost killed me heaving them across the yard, but I’m proud to say that I mixed each of them by hand and threw the resulting concrete into the hole that same afternoon. The hole was now about two-thirds full of concrete, and the big old hunk of quartzite was now permanently embedded in the concrete, adding mass and anchoring to the foundation. Once the concrete had dried, I used the soil heap to fill the remains of the hole, soaked the soil thoroughly with the hose, and went back inside for an icy beer to celebrate a job well done. I gave that concrete a few days to harden further before testing the pole for stability. The test was designed to measure the stiffness of the pole and to determine how rapidly it could dissipate kinetic energy. I did this by thumping it with a log and watching to see how fast it vibrated and how long it took those vibrations to damp. I didn’t bother taking an actual measurements since I was only interested in qualitative results: It either vibrates for a long time, or a short time. The vibrations were fast enough that the end of the log, this twenty centimetre diameter hunk of telephone pole, shook fast enough to blur. The bad news is that it took several seconds for those vibrations to die down. Once the weight of the mount and the telescope was added, loading extra weight to the end of the pole, this would only get worse. This was bad news, since it would make my telescope pier less stable than even a cheap tripod, and certainly worse than the surveyor’s tripod I have now. Still, it meets my original specifications: Be cheap, be easy to dispose of, and hold polar alignment between sessions. So, the next phase was to turn the pole into a pier. This turned out to be a lot easier than I’d expected. I just bought a 25cm square piece of 8mm steel plate, some drill bits, and some fastening hardware. I drilled seven holes into the plate – four for screws to attach it to the pole, three to accept bolts to fit through the mounting holes on the telescopes wedge mount. 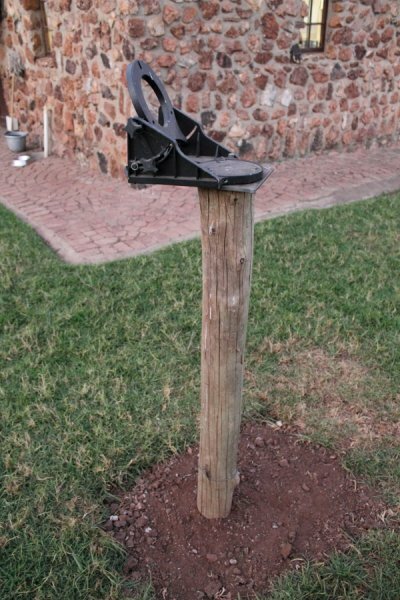 And then I carved a few holes into the pole to accept the heads of the bolts I’d use to mate the plate to the wedge. The results can be seen in the attached images. So how does it perform, fully loaded with a scope while trying to actually observe a real night sky? Well… better than I expected. It turns out that, in actual use, I never actually hit the telescope with heavy objects, so any vibrations start out quite small. Small disturbances, such as are caused by working the focus or slow-motion knobs, settle acceptably fast, and only the larger bumps, from fumbling clumsily in the dark, cause any frustrating delays. So… hooray! It still remains for me to perform a proper polar alignment and attempt photography, but for now this set-up has exceeded my bare minimum standards of success. Is there a way to improve on this without ripping it up and starting over with proper materials? I think so. First off, I need to shorten the pole – as it stands now, the eyepiece is fairly close to eye-level when I’m standing. This means there is an awfully long movement arm for any vibrations to work along. Lots of leverage for even small bumps to make that wood flex, in other words. 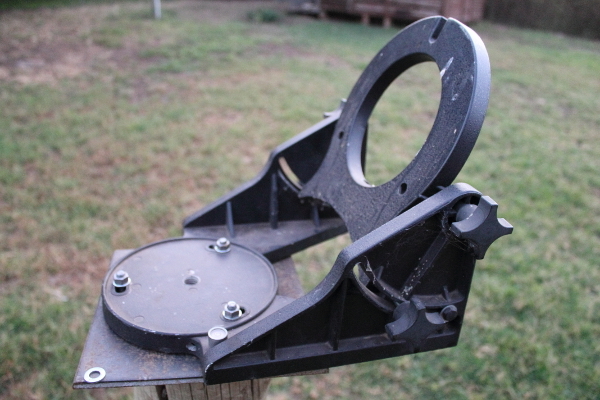 If I disassemble and remove the plate, cut the pole down to half it’s length, and then reassemble, I’ll have a much stiffer mount. This will also allow much more slack on the wiring when I’m imaging, which is a nice safety feature! The second thing I could try is some sort of damping mechanism – perhaps by hanging chains from the corners of the plate, to help dissipate vibrations. However, these could also introduce vibrations, if (read: When) they get disturbed by the wind or a clumsy operator. So I think I’ll settle for shortening the pole for now. Future plans: One day I’ll do this again, properly. The only real difference the second time around: I won’t use wood. Instead, I’ll either use a similar diameter steel tube, packed with sand, or I’ll cast a concrete pillar. The concrete option has the benefit of allowing me to cast mounting bolts directly into the top of the pier, saving me from needing to mess about with mounting plates. But that’s for the future. For now I’ll just work with what I’ve made so far. Dude, that is very cool. I’m even tempted to do one of these for myself. If I do, I’ll let you know.